A TPE (Thermoplastic Elastomer) that is easy to print, with amazing bonding capabilities. You will earn 50 loyalty points with this purchase worth £0.50 that you can use on this order. Please note, postage within the UK is included in the price you see. 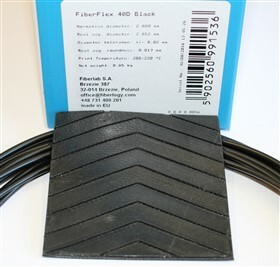 Fiberlogy are a Polish company who use high tech engineering equipment to make the very best printing filaments. Using their years of experience in plastic processing and extrusion profiling to make quality products, such as the Fiberwood, HIPS, HDPLA and now FiberFlex 40D a Thermoplastic Elastomer otherwise know as TPE. We found this material easy to print on just a Wanhao 4 printer, at 45mm/s, the bonding was amazing and the finished product was almost like a molded rubber object. You can hardly see the layer bonding even when printed at 0.2mm, the printed mat in the photo above (for product view, not colour reference), had great detail, did not split, or show signs of stress when continually bent and twisted. The material is also resistant to many chemicals and gases such as, Gasoline, Carbon Monoxide and even salt water! You can read the full list on the Technical Data sheet below. Need to know more about shore hardness.